The most avid reader of my blog doesn't even own a computer, if you can imagine that! Nanni has a stack of my blogs, printed on real paper rather than shining on a computer screen, on the table next to her chair. Of course the fact that she gets to read the blogs without a computer is a miracle of modern technology (printers! ), but Nanni is by far my number 1 fan. 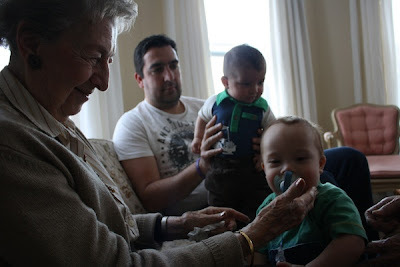 And now she is also Lucas' number 1 fan, somehow managing to shower us with equal amounts of affection and attention as only a great grandmother can. 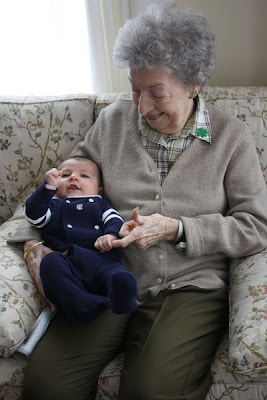 Today is Nanni's birthday and I must use this blog post to wish a very happy and exciting birthday to my great great-grandmother from me and Lucas! Happy Birthday Nanni! Thank you for all your love. You have given me the gift of the word "cheechong" for the Italian dialect version of my pacifier. You have shown me that great-grandparents have even more rights than grandparents, so thank you for my first dollop of whipped cream and then cannoli cream way back when I was a littler baby. You gave me my very first pair of Italian shoes, in keeping with many other people in our family! 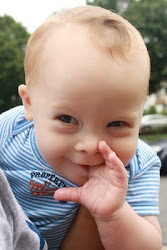 You also have kept Lucas' chin dry from the copious amounts of drool that pour from his lips. And you have, of course, bequeathed to us a wondrous Italian heritage cloaked in love and Parmesan cheese. We as babies are very honored to have you as our great grandmother. We wish we could hug you in person today.